I hereby wish to thank the Central Archive of the Russian Federal Security Service, through you for the informative material, including answers to questions by experts C. Berger and B. Birshtein and conclusions of the archive in the case of Raoul Wallenberg, the Swedish side of the transmitted № 581 from November 2, 2009. At present, our experts continue to analyze the material. Mrs. Berger is going to Moscow next spring. We read with great interest the responses of the FSB, especially with what is said about the use of the term « held » in connection with several key interrogation in July 1947, as well as very high probability that the prisoner number 7, which questioned 22 and 23 July , was Raoul Wallenberg. If this hypothesis is confirmed, it will be a new, almost sensational fact to determine the fate of Wallenberg, given the importance that is still attached to the day of 17 July 1947, which is dated as Abakumov letter to Molotov on Wallenberg, and report Smoltsova. The Russian side proceeds from the fact that July 17 is the date of death of Wallenberg, the Swedish side also believes that in this day there have been developments of decisive importance for the fate of Wallenberg. It is therefore imperative to find more information about what events might have occurred during the 17 to 23 July, and, above all, to get an opportunity to discuss what can be done on this issue. What Happened to Raoul Wallenberg? 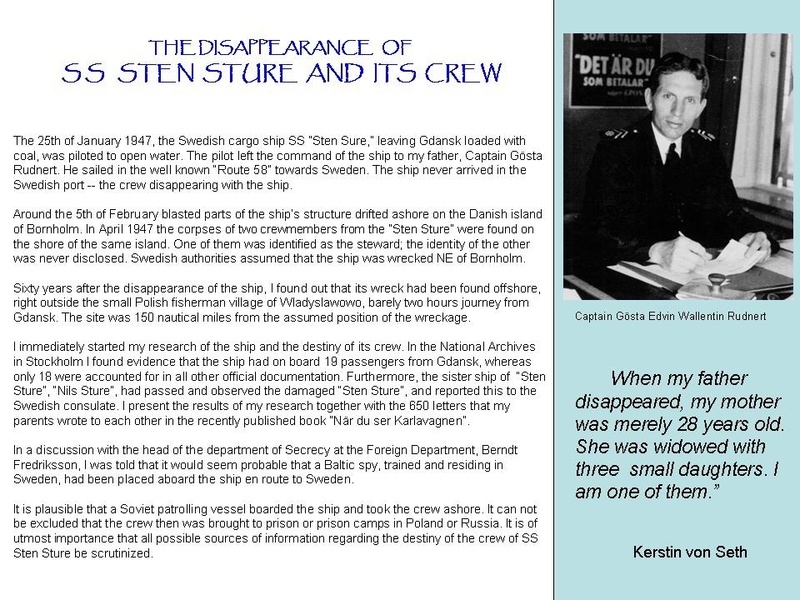 22/10/09 : The Disappearance of « SS Sten Sture » and its Crew. 27/05/09 : What Happened to Raoul Wallenberg?